This is the studio that artist Francis Bacon made home. Description: One of the 20th century's great artists, Francis Bacon (1909-1992), moved here in October 1961 after a decade of painting in numerous places. The moment I saw this place I knew that I could work here, enthused Bacon. Indeed it was here that he painted some of his most celebrated works including Three Studies for a Crucifixion (1962) and Portrait of George Dyer Talking (1966). 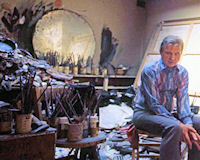 The studio was on the first floor and bacon had a sky light put in and while painting he rarely emptied the place preferring the mess of chaos aided his inspiration, the studio itself became almost as iconic as his work. He remained secretive about his methods and protective about his studio space, rarely allowing observers. Indeed, it was only after his death and the removal of the space to Dublin that it could be studied.